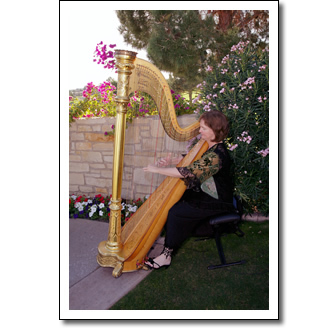 For elegant music on one of the most important days of your life, the harp is unequaled. 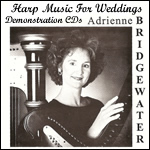 As you choose the special aspects of your wedding day, let Adrienne Bridgewater's ethereal gold harp and beautiful voice help create a truly memorable ceremony. 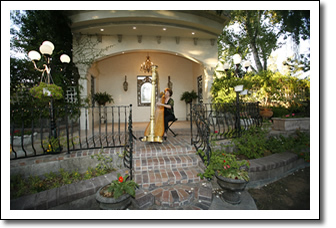 PRELUDE - Harp music during the time when guests are arriving and being seated sets the tone for an uplifting and joy filled ceremony. PROCESSIONAL - Music for the bride's entrance and that of her attendants can be traditional music, such as The Bride's March, Canon in D or other music of your choice. SOLO - There may be an opportunity for a special song during the ceremony, perhaps during the unity candle lighting or before or after the exchange of vows. Adrienne can underscore any symbolic moment by playing a quiet instrumental interlude or singing your favorite song with harp accompaniment. RECESSIONAL - At the conclusion of the ceremony Adrienne will play your choice of triumphant music for the newly married couple and attendants to exit. Reception Music -Harp music can create an elegant atmosphere during the cocktail hour and dinner as well, allowing guests to talk without having to shout to be heard! Adrienne was voted "Best Ceremonial Soloist" in 2001 & 2008 by the Reader's Poll of The Wedding Chronicle. 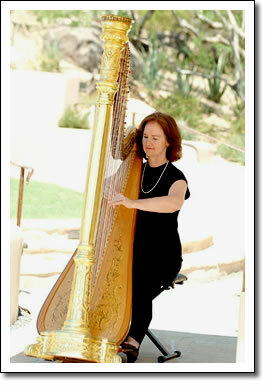 During Adrienne's years as a professional harpist she has worked with many outstanding wedding business professionals and vendors. Below are a list of those wedding vendors who are most highly recommended. Contact Adrienne for availability and pricing.